The Environmental Studies Certificate Program provides students pursuing a Masters degree from any disciplines with the opportunity to gain an additional interdisciplinary qualification in environmental studies. The international, interdisciplinary format, as well as the workshops and lectures held by environmental researchers from all over the globe, make this program the only one of its kind in Germany. The qualification, consisting of 33 ECTS-credits over the course of four semesters, is completed alongside the main degree subject. It allows students to look beyond the confines of their disciplines and gives them a broader disciplinary base that is appreciated by employers both inside and outside of academia. The courses are offered in both English and German. The current and complete course catalogue offered each semester is also available as a pdf download under Courses. Please also have a look at the LMU´s LSF for a preliminary list of courses. For those interested in the variety of courses offered in the past, kindly look at our PDF Archive. The only mandatory module (Pflichtmodul P1) "Environment and Society: International Perspectives," requires regular attendance of the Lunchtime Colloquium at the Rachel Carson Center for two semesters as well as a related reading course on fundamental texts in environmental studies. 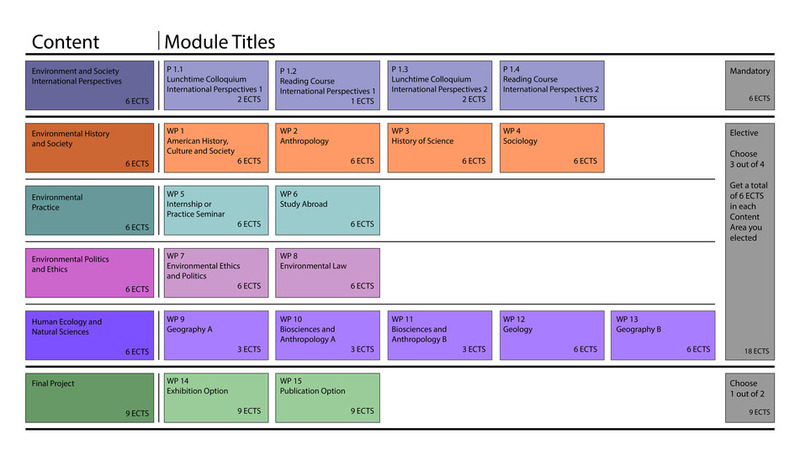 In addition, students must choose elective modules, or WP (Wahlpflichtmodul WP 1 to WP 13), from three of the following elective content areas: "Environmental History and Society," "Environmental Practice," "Environmental Politics and Ethics," and "Human Ecology and Natural Sciences." Six ECTS credits must be acquired in each content area. Each WP module of an elective content area can only be counted once. It is possible to receive credits for an applicable module from the student's primary course. 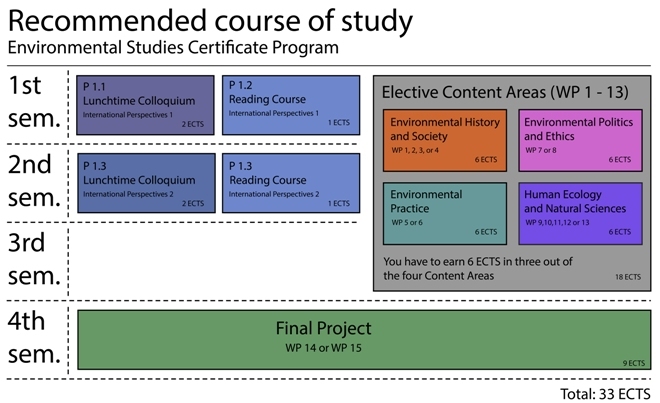 One of the elective modules may be replaced by an optional internship (WP 5) or a study abroad program of at least four weeks (WP 5) in the content area of "Environmental Practice." This may be completed at any time during the program. The students must submit a final project to complete the program. This may take the form of an exhibit (WP 14) or a publication (WP 15). The final project is worth nine ECTS credits. For more information, please consult our "course of study" below (also available as a pdf download in basic and detailed versions). Acceptance to the program requires students to have an academic degree (Bachelor’s or equivalent), a Vordiplom, or they must have passed the intermediate exams for a higher education degree of at least seven semesters, in Germany or abroad. In addition, they must currently be enrolled at a university and must demonstrate their suitability in a selection process as determined by the certificate program rules. If you have questions please refer to our FAQs or contact us.